The Surprising Story Of A Super Bowl Snack : The Salt From Cheetos to Doritos, fried corn snacks have become a fixture at Super Bowl parties. But the original American corn chip, the Frito, was first meant to be a healthy side dish and ingredient for cooking. Presented on a gourmet plate or eaten out of the bag the chips came in, Frito Pie is an American standard. This Super Bowl Sunday, millions of Americans will watch the game with bowls of corn-based snacks at their side. Whether you prefer Doritos, Cheetos, or even Funyuns, you owe the pleasure of that crunchy munchy to the humble corn curl that started it all: the Frito. This week, our friends at Smithsonian's Food & Think blog trace the origins of the Frito back to entrepreneur C.E. Doolin's encounter with a Mexican frita, or "small fried thing," made of cornmeal, water, and salt. It was 1932 in San Antonio, and the flavor so inspired Doolin that he found the man responsible for the chips, a Mexican immigrant named Gustavo Olquin, and bought his equipment, recipe, and business contacts for $100. Over the years, Doolin expanded the business, mechanized the chip-making process, and invented new flavors and products, like the Cheeto. The Fritos brand went on in 1961 to merge with the Lay potato chip company, another Depression-era family business. Doolin died in 1959, but had already paved the way for an explosion of corn-based snacks – from Cheetos, to Doritos, to Tostitos, and even Funyuns. And like the original Frito, each of those products is essentially just fried cornmeal with flavorings. Unlike Fritos, though, Funyuns and Cheetos are extruded: Their puffy texture comes from batter being mixed with hot water under pressure and exposed to air. You can see it and the rest of the Funyun-making process happen inside the factory in this recent video from National Geographic. The Fritos brand pulled in more than $1 billion last year — much of it from the winning combination of corn, fat and salt. It's a strange legacy for Doolin, who was actually something of a health nut, according to a 2007 story from NPR's Hidden Kitchens series. 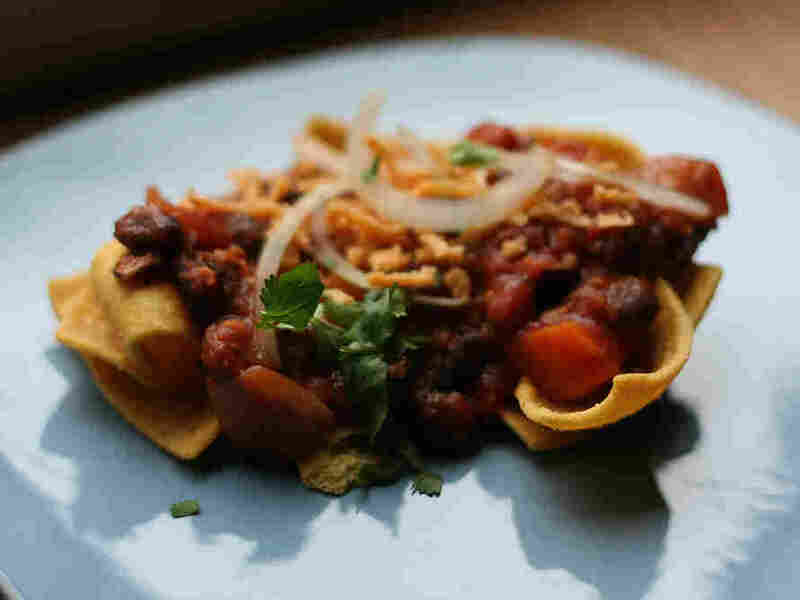 Although his wife created recipes like Frito Pie and Frito Jets (Fritos smothered in chili and dark chocolate, respectively), Doolin always imagined Fritos as a side dish for meals, something to eat by the handful – not by the party-size bag. Doolin's daughter Kaleta told NPR's Kitchen Sisters that she and her siblings "were raised vegetarian, and people made fun of me for eating yogurt and figs in my sack lunch." She said her father would even bring home bags of Fritos he'd taken off the manufacturing line before they'd been salted. The success of the less-healthy versions of his snacks doesn't seem to have bothered Doolin during his lifetime, though. Were he alive today, he might be happy to see that they've become a staple of Super Bowl parties nationwide. But I wonder how he'd feel about Vanilla-Caramel Corn FRITOS® Pie.